Digital finishing is a term used in the label industry for a variety of techniques used to finish labels. In our desktop / desk size digital label printing systems that you can use in your own office or works we use the term ‘finishing’ to mean cutting or laminating or varnishing or slitting or motorised roll winding process that completes the labels to a nice wound roll after you have printed the labels images. 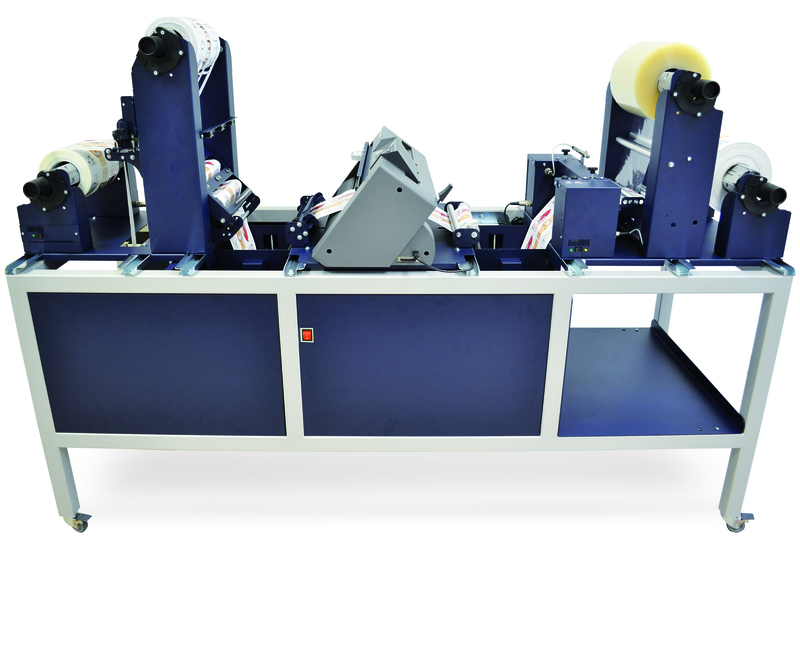 We have a range of motorised winders that will make neat rolls after printing. Some printers will need an UNwinder to feed the labels into the printer, then most will need a REwinder to motor the labels back onto a neat roll. 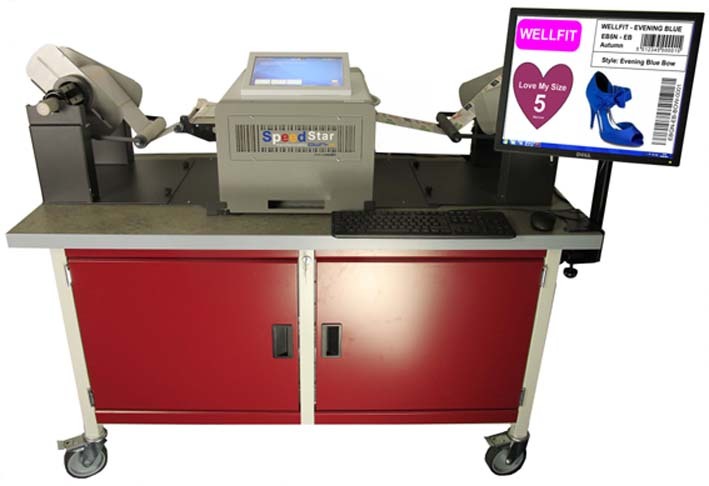 Its popular and needy with some high speed printers and with liquid ink flowing like MEMJET to ensure the printer is mounted to a flat desk and that the UNwinder and REwinder are also flat and aligned to the printer using a link bracket that allows for good alignment and adjustment, also preferably on castors for movement and cleaning. For this reason we sell a range of workstation desks with flat lino covered top and cupboards for a PC computer and consumables, it makes a nice mounting for a flat vesa display and the keyboard and mouse. Some digital label printers are best when you use the full print width available, many are based on an 8.5 inch (216mm) wide print capability. Having extra width is also useful to add a ‘printers bleed’ margin around the label. This will increase the effective width of the label roll but allows for an over spray area so you can print colour up to and slightly over the edge, then when the labels is removed you can be assured there will be no white edges. For shaped labels its best to kiss cut the shape into a rectangle labels with normal gap if for hand apply the label can then be ‘popped’ from the rectangle and the rectangle with gap is easy for the printer to register onto. 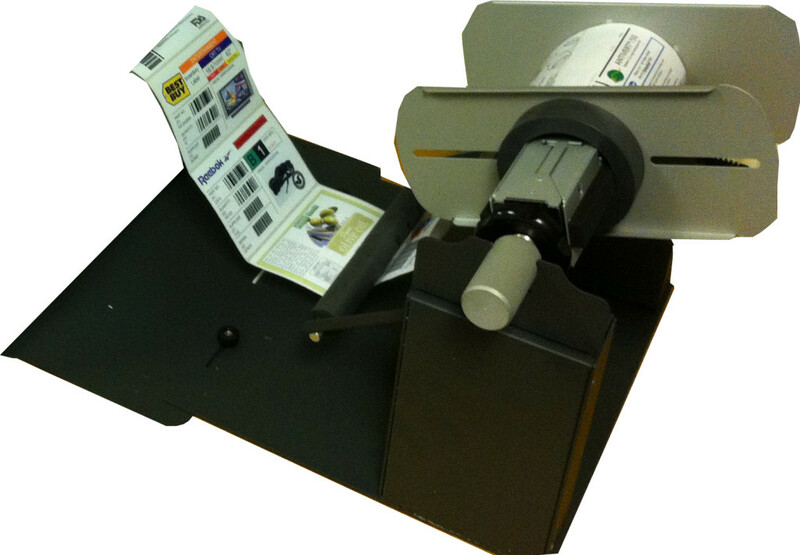 If the labels are to be used in a motorised dispenser or automated label applicator then its best for us to make the labels on the roll with the waste left on. We print a black registration mark on the backing between each label so the printer has something to register on. On the front you print the label images. Then after printing we need to strip of the waste again using our Matrix Removers. Usually most of our desktop label printers use pre-cut labels on rolls but there is a cost to having the labels pre-cut. 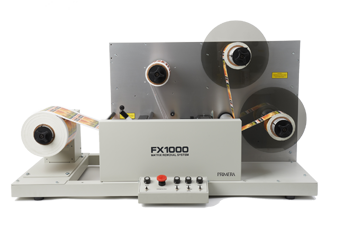 The new digital finishers in our range enable users to buy the lowest cost un-cut rolls of self-adhesive roll labels media then use their digital printer to print the images,, then use the digital finisher to cut out the labels any size or shape. A digital finisher may also have a laminating section where a thin clear pp layer can be added to the top of the labels surface before cutting for extra durability or change of surface finish look. 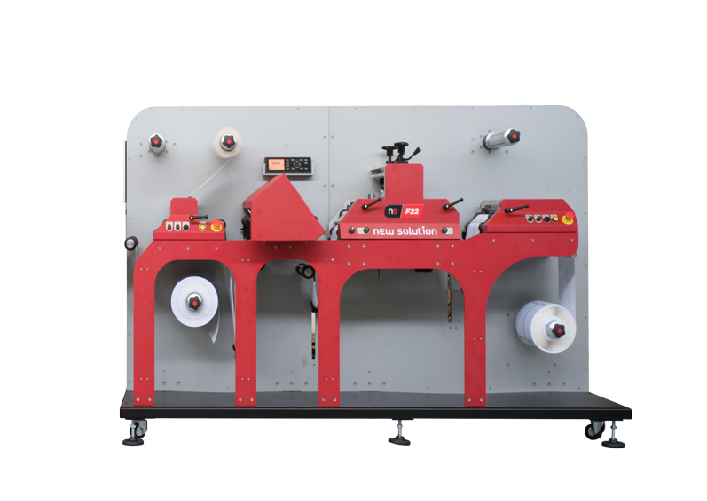 The finisher will normally also include the matrix stripping and slitting facility so to wind the labels to finished rolls. With a digital label printer and digital finisher its possible to make all the labels you need in house to any size or shape and in any quantity with selection of the recommended equipment. Digital finishing means no conventional die-cutter tooling cost ever regardless of size or shapes needed. You print a small black square registration mark alongside each label image row. The digital finishers use an optical sensor to relocate the registration mark and moving blades or laser beam to cut the shapes. 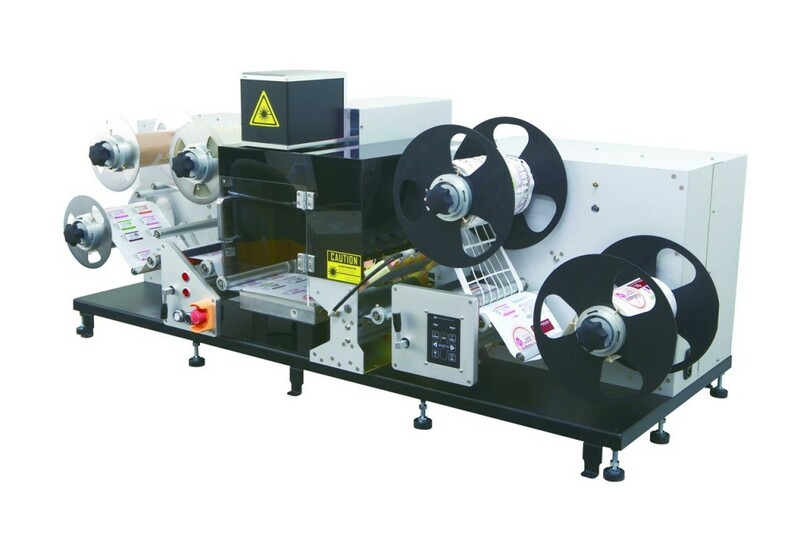 The NS F22 combines selectable liner or linerless laminating, digital blade any shape cutting, servo rotary high speed die-cutting, slitting and roll rewinding.